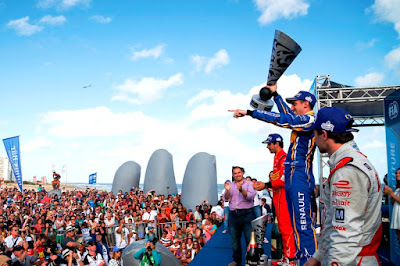 For the first time this season the Renault e.dams star failed to take pole position, but from fifth position on the grid he produced a charging drive to the delight of over 10,000 passionate Uruguayan fans to score his fifth career victory. The seed was sewn at the start, and from the ‘clean’ right-hand side of the grid, he sprinted off the line to instantly take fourth place from Abt Schaeffler’s Lucas di Grassi. The DS Virgin car of Sam Bird and the Dragon Racing entry of Loic Duval soon fell prey to the Swiss, and it was only a matter of time before pole-sitter Jerome D’Ambrosio (Dragon Racing) yielded as well. The move for the lead was met with a huge cheer from the grandstands, and once ahead Buemi showed no signs of relinquishing his grasp on the winner’s trophy. 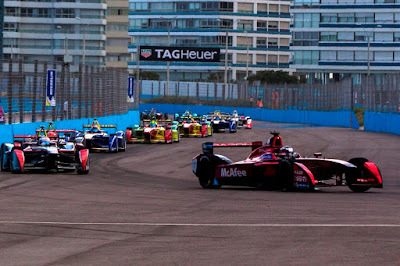 On the ‘dirty’ side of the grid, di Grassi knew that keeping Buemi behind at the start would be a tough ask, and knew he had to try to keep pace with the eventual winner as he fought through the field. In his attempt to pass Duval he very nearly hit the wall and instead lost a place to his Abt Schaeffler team-mate Daniel Abt. A small error by Abt allowed di Grassi back through and he pushed hard to ensure he was as close as possible to Bird and Duval when they all came in for their mandatory car change. A perfect pitstop meant he leapfrogged into second place and closed right in on Buemi as a Full Course Yellow was thrown after a Battery Management System error caused Bird’s car to stop on track. Di Grassi gave everything to put Buemi under pressure, but couldn’t get close enough to force a move or a mistake and settled for second. 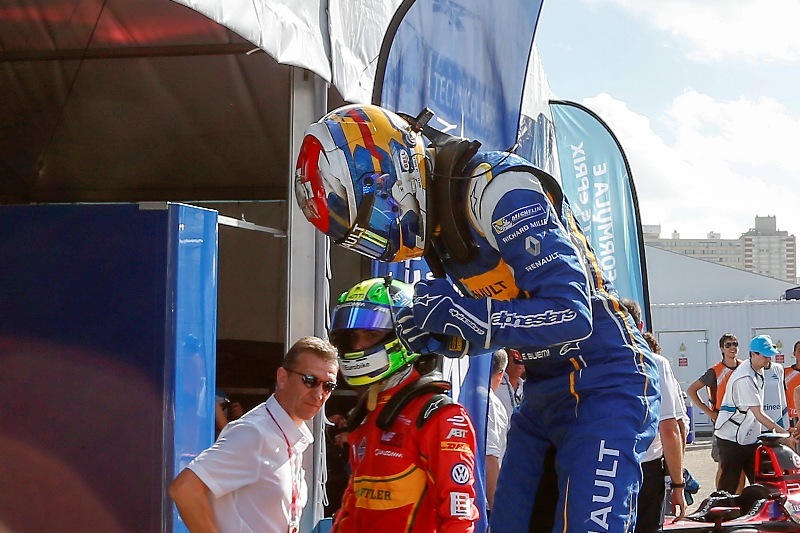 From his first-ever Formula E pole, D’Ambrosio made a perfect start and comfortably led from Bird, who beat Duval off the line to slot into second. A few tenths at a time, D’Ambrosio eked out the lead, but as soon as Buemi made it into second his advantage was decimated – Buemi lapping a full 1.5s faster than the Dragon Racing star in his first lap in clean air. An overly-cautious entry into the pits gave di Grassi the chance to steal second place, and in the closing stages D’Ambrosio was once again in a fraught battle with his team-mate Loic Duval. 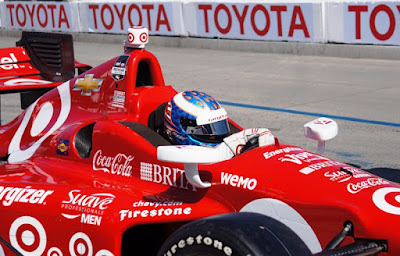 D’Ambrosio held on for third, and with Duval fourth it was another strong race for Jay Penske’s team. Just over six second covered the top four, but there was a huge gap back to fifth place and Renault e.dams’s Nico Prost. Sixth place went to Team Aguri’s Antonio Felix da Costa, easily the lead season one tech runner and he felt it was genuinely the best result possible in the circumstances. Jacques Villeneuve was unable to take the start after seriously damaging one of his Venturi chassis in a qualifying shunt. 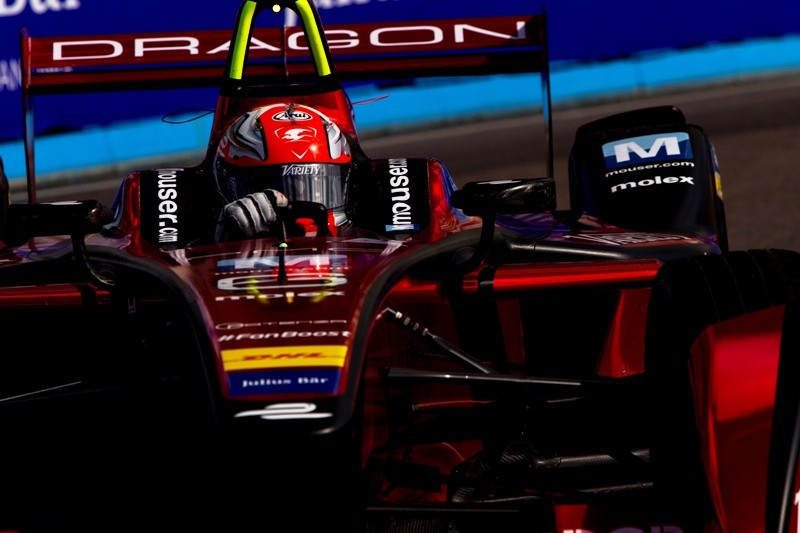 Jean-Eric Vergne used FanBoost to make his way by the Venturi of Stephane Sarrazin and into the top-10. 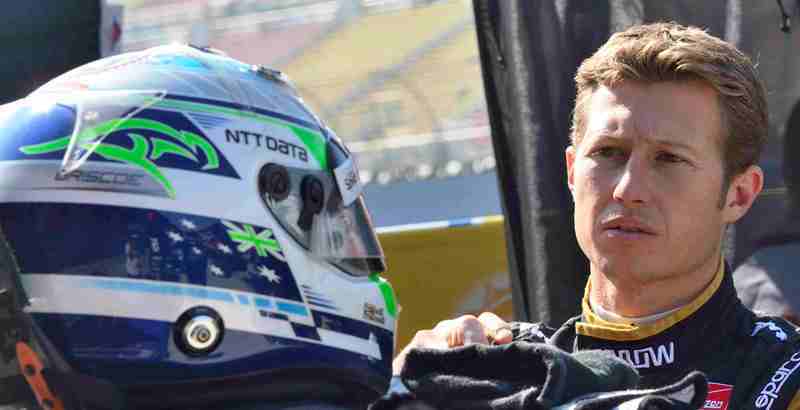 He gained a place when Oliver Turvey was penalized for his NEXTEV TCR team releasing him too early from his pitstop, and set to work on battling with Turvey’s team-mate Nelson Piquet Jr.
Coming onto the final lap the pair traded places and paint, but Piquet remained ahead. 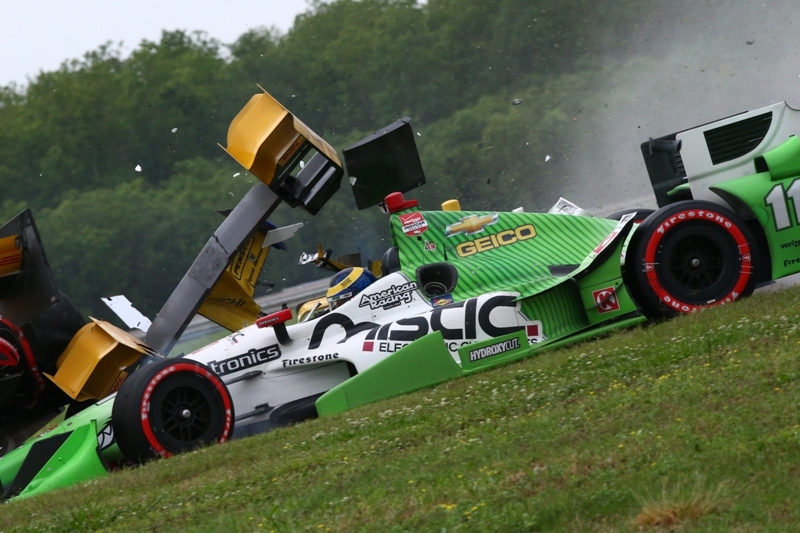 However, he lost rear grip on the entry to the chicane and slammed sideways into the tire barrier. 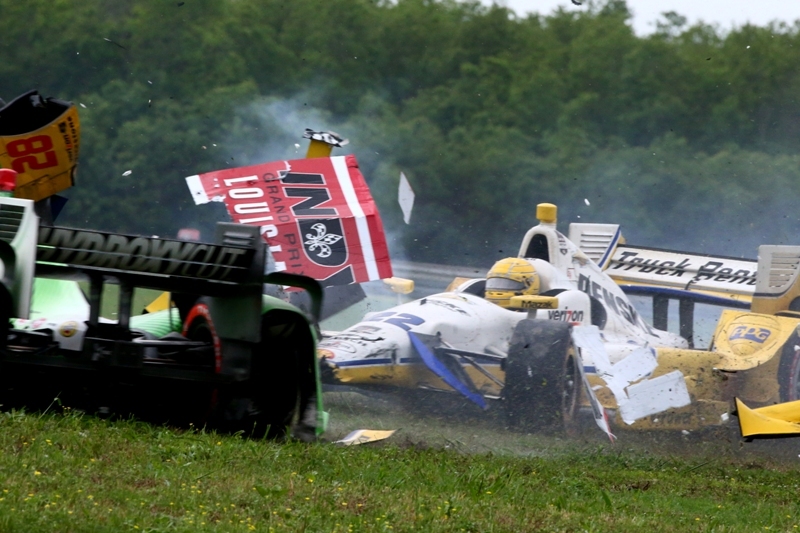 Vergne was elevated to seventh, while Piquet was unhurt but out. 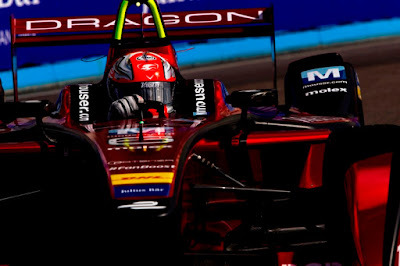 Daniel Abt was eighth, Sarrazin ninth, while Robin Frijns, whose Andretti team changed the entire powertrain (including battery) in his second car in between qualifying and the race, rewarded their efforts with the final point in 10th. With a beach party following on from the amazing podium ceremony at the famous hand, there was a fantastic ‘end of year’ feeling about the whole event. 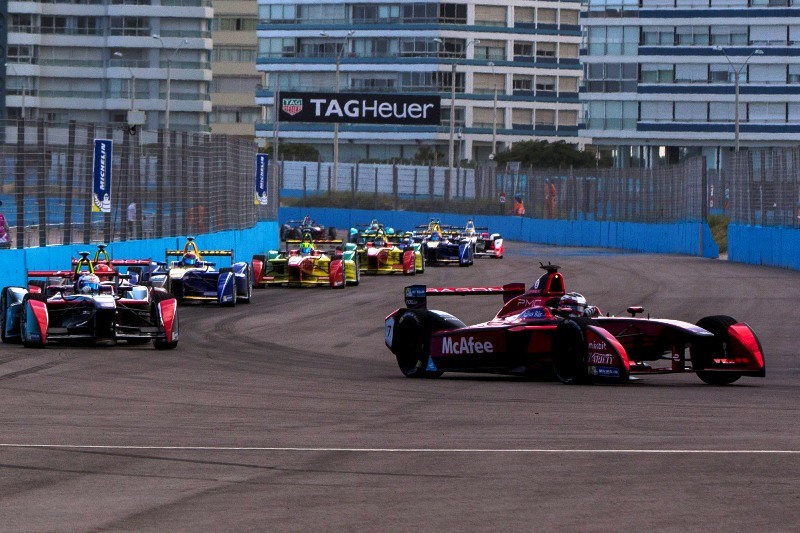 There’s now 48 days until Formula E returns to South America for the Buenos Aires ePrix. Last year it was arguably the most exciting event of the season, and Buemi’s rivals will be hoping that he doesn’t have things his own way. 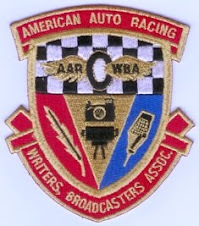 To many who have followed professional American open-wheel automobile racing over these last fifty plus years, in terms of talent in the paddocks on both teams and drivers, the 2015 season would easily rank in the top five all-time seasons. 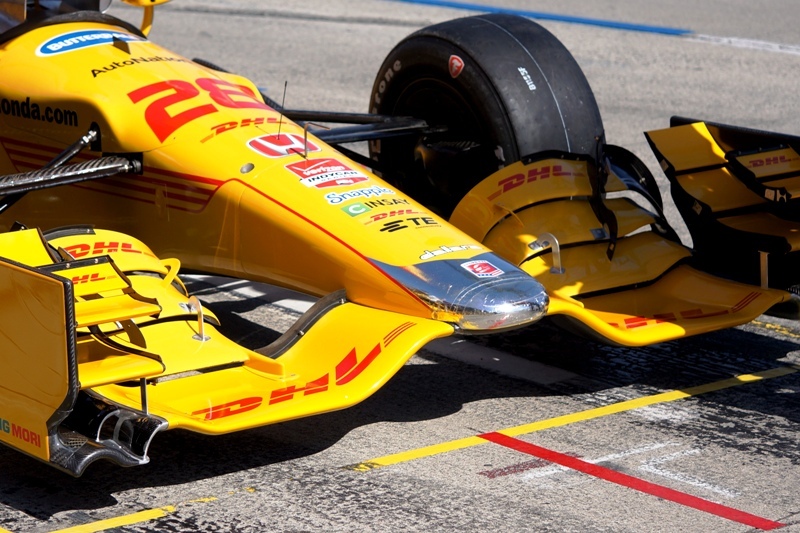 The 2015 season was the first season that featured the new rules governing aerodynamic body panels manufactured by Dallara but utilizing input and designs dictated/negotiated by the manufacturer of the engines used by each team - Chevrolet or Honda. Once each team was given the solution of body and wing parts to use on the racing platform, within limits, the teams could decide upon the configurations and settings allowed. Early in the season, the cars that ran Honda seemed to be a bit behind Chevrolet on in and out cornering speed ... to wit Honda put forth, (paraphrased) our wing and body panels can be configured in about a million different ways given all of the options available. The problem with this potential breadth of choice options, once a proper engineering set up has become competitive with the more simple approach settled on by Chevrolet, about 999,000 options for adjustment become useless or irrelevant. So on this issue ... who's Nice or Naughty? 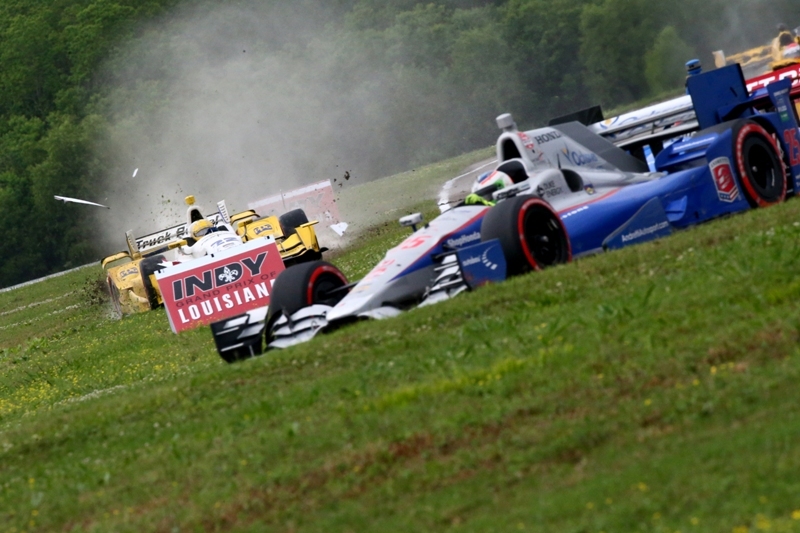 The manufacturer, the engineering staff who figured out the best set-ups?, or the overall rules package crafted by the Verizon IndyCar Management? 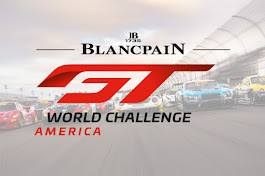 In an effort to place the gifts of this season under the tree, Josh Farmer's Championship Racing Radio in show #4, with Edmund Jenks, seeks to discuss the Best (Nice) and Worst (Naughty) of this 2015 breakout season that began with an out of country race cancellation in Brazil without having a make-up race be run at any time for the balance of the season. 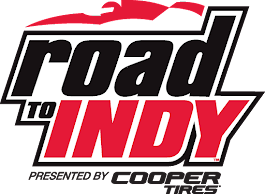 The discussion in show #4, however, will not focus on Verizon IndyCar Management but, rather, the races run, teams, and drivers. Management, for the most part, may qualify for a lump of coal beginning with their policy of "Race Control By Committee" which had the person who was in charge of this policy - Derrick Walker - resign from the position after 2/3ds of the season had been put to bed ... with cookies and milk. Championship Racing Radio 4: Naughty or Nice? Intro: (Less than 5 minutes) introduce ourselves. 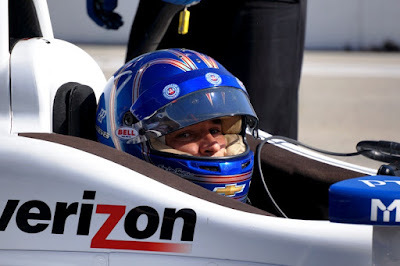 ○ Best Move – Penske Racing's Will Power – Sonoma for the Verizon P1 Pole Award - Will Power saw the performance CFH Racing's Josef Newgarden was able to do by placing Black sidewall tires on his Dallara so Will ordered up a set be placed on his Chevy and with the last seconds of qualifications winding down, snatched the Verizon P1 Pole Award away from Newgarden. 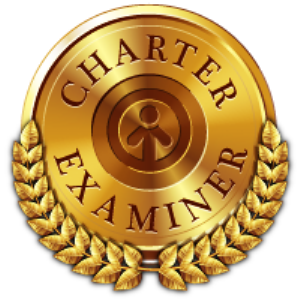 ○ Most Improved driver – Rahal Letterman Lanigan Racing's Graham Rahal – He improved so much as a driver, it made him marriageable – Courtney Force and Graham got married Nov. 21, 2015 and are honeymooning in Fiji and New Zealand. 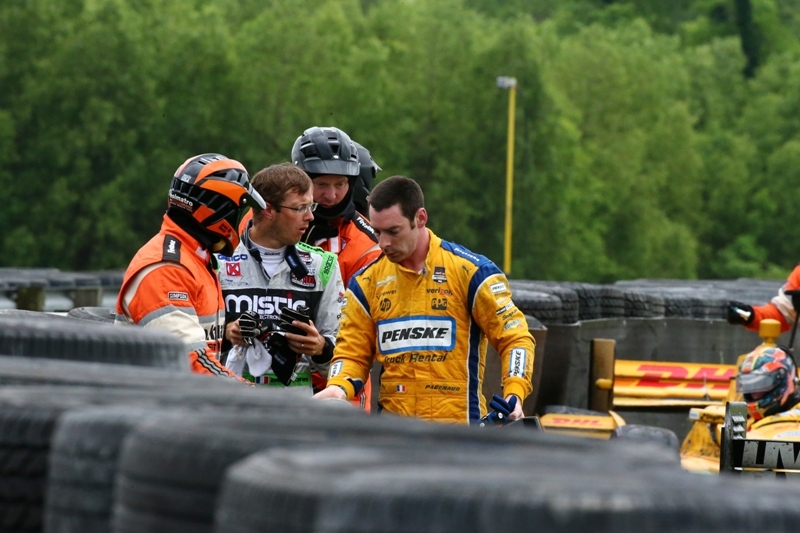 ○ Worst Driver – Farmer - Dale Coyne Racing's Francesco Dracone (never finished in the Top 20) | Jenks - KV Racing Technology's Stefano Colitti – 16 Races with 5 DNF / Dale Coyne Racing's Francesco Dracone – 5 Races with 2 DNF - Josh Farmer compared Francesco Dracone as being "as slow as Milka Duno." Edmund Jenks asked Josh, "So you believe that Dracone is Milka Duno without the mascara? ... as far as we know, right? 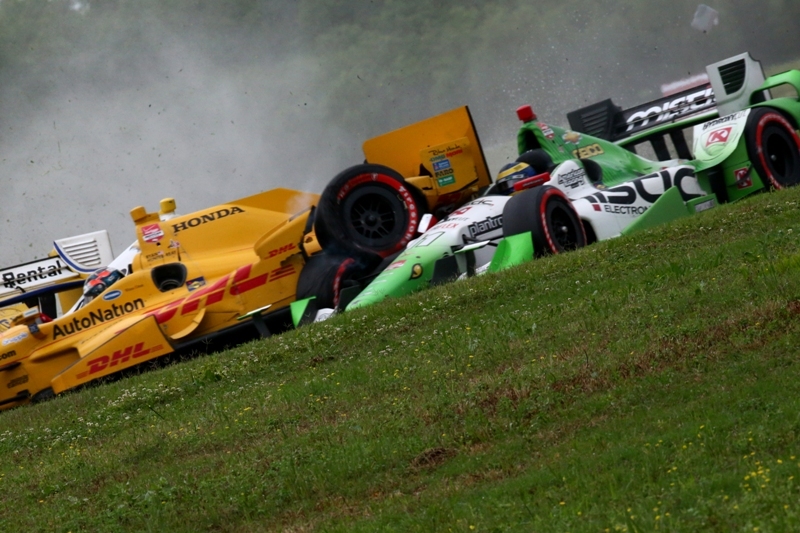 ○ Worst Race – Indy Grand Prix of Louisiana "NOLA"
○ Worst Move - Farmer - Andretti Autosport's Ryan Hunter-Reay (2015 P6) - The final full course YELLOW Flag came from a massive incident between Sebastien Bourdais, Ryan Hunter-Reay (RHR), and Simon Pageneud (on the outside) as the drivers attempted to go three-wide in turn 3. RHR ended up pushing Pagenaud off of the track | Jenks - Penske Racing's Will Power - Diving move in Turn 10 at St. Petersburg on teammate Juan Pablo Montoya with many laps remaining in the race. It turns out that these two drivers got together during the final race of the season at Sonoma Raceway. Given that both drivers were in the hunt for the championship, one wonders if these points were able to be retained, would Scott Dixon have his 4th IndyCar crown. 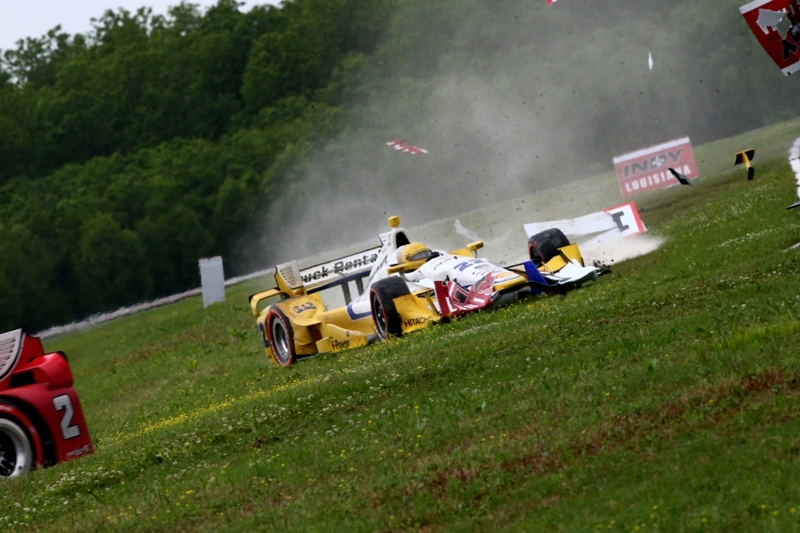 Pageneud slid off the track into the mud, and then back on the track in the next right-hand corner 4, collecting Hunter-Reay and Bourdais sending all three cars across the grass. ● Anything else that we might want to cover - If anyone finds themselves in the Los Angeles area over the holidays, make a special trip to the newly renovated and re-opened Petersen Automotive Museum which resumed operations December 7, 2015. Named 10 best automotive museums in the world by CNN. Here's hoping that all who happen to follow Verizon IndyCar Series never see a lump of coal and are always thought of by Santa Claus as ... Nice!